The Met Office has issued a rare red weather warning for parts of Scotland. 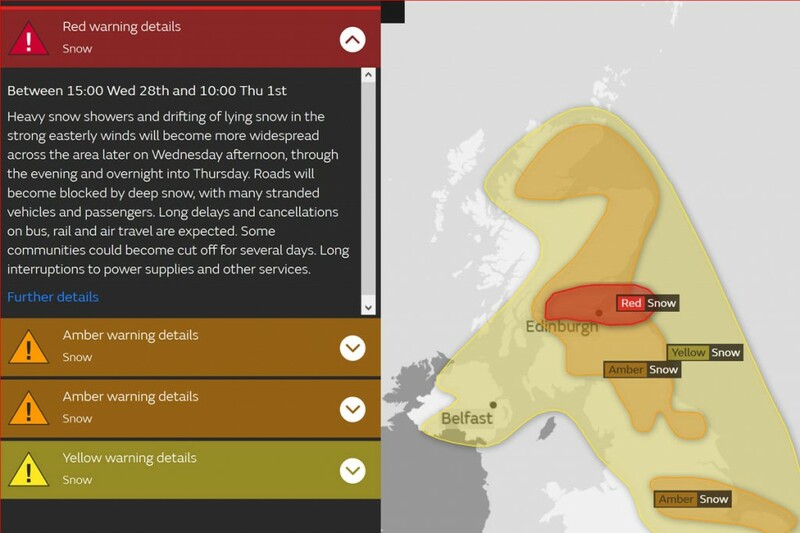 The red alert means risk to life is likely with snow falling to depths of up to 40cm (16 inches). The areas affected are: Central, Tayside, Fife, south-west Scotland, Lothian and Borders and Strathclyde. The red warning comes in to force at 3pm on Wednesday and remains in operation at 10am on Thursday. The chief forecaster for the Met Office said: “Snow showers already affecting the area will become heavier and more prolonged later on Wednesday afternoon and at times through the evening and overnight period, with 5cm [2 inches] of snow falling within an hour in some places and lying snow reaching 20-30cm [8-12 inches] and possibly 40cm [16 inches] in a few places by mid-morning on Thursday. A red warning means extreme weather is expected. Members of the public should take action immediately to keep themselves and others safe from the impact of the weather. Widespread damage, travel and power disruption and risk to life is likely. People must avoid dangerous areas and follow the advice of the emergency services and local authorities. An amber warning is presently in force for most of Scotland, northern England and Yorkshire and the Humber, meaning travel disruption and power cuts are possible, with the public urged to change plans. Lesser yellow warnings have also been issued for most of northern Britain for Wednesday and Thursday. High winds on mountains will add to difficulties for hillgoers, with windchill as low as -25C forecast for summits in Scotland. Gusts of almost 60mph have been recorded on the summits of Cairn Gorm and on Great Dun Fell in the northern Pennines. More details are on the Met Office website. Mountain weather forecasts can be accessed via grough’s links page.